The mobile app developed to Museum exhibition named “Sicilia ritrovata. Arti decorative dai Musei Vaticani e dalla Santa Casa di Loreto” (Sicily found. Decorative arts from the Vatican museums and the Holy House of Loreto). The exhibition, housed in the Museo Diocesano of Monreale (MDM) and sponsored by the Centre for Decorative Arts in Italy (ArtiDec), showed handmade silvers, ivories and corals, built and restored by the school in Palermo and works created by the coral workers of Trapani. 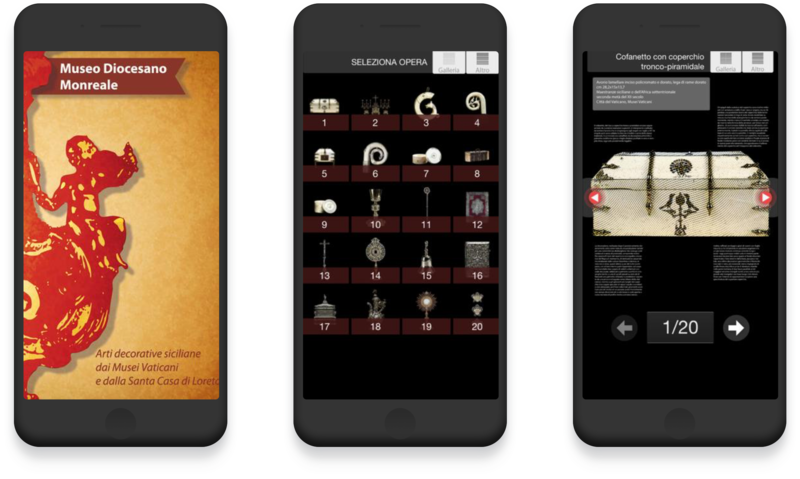 The mobile app developed to enjoy a different and immersive experience inside the Diocesan Museum in Monreale that approached art and technology. It was available also on iPod devices during the exhibition.